To me, this is one of the most challenging reminders of God's will in Scripture. 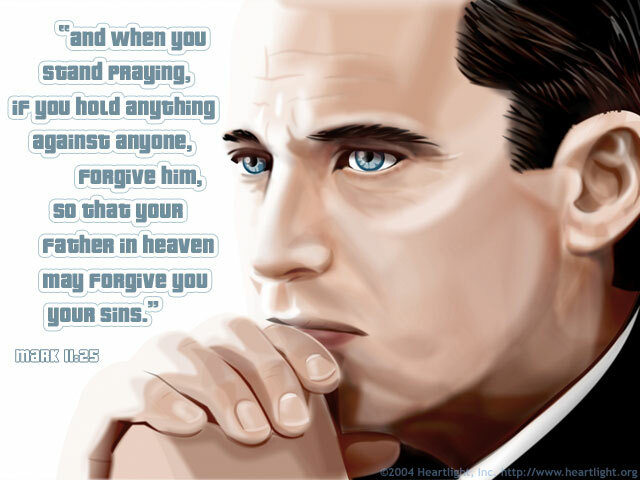 I must forgive others! When I refuse, it cuts me off the stream of forgiveness that God so longs to give to me. While forgiving others is never easy, God has not only commanded us to do it, he has also given us his Son as an example of forgiveness. In addition, he has promised to empower us to be able to do his will by the power of the Holy Spirit. The real issue: Will we let go of our bitterness toward those who have wounded us? Dear God, I want to forgive ____ of the sin committed against me. Please block cynicism and bitterness from my heart. Please empower me to forgive as Jesus did. In addition, dear Father, please teach me what my commitment to forgive actually means in terms of the life changes I need to make. In Jesus' name I pray. Amen.